The Christmas Eve cooking has begun! Started soaking the baccala last night. Before I go totally MIA, I would like to share my Christmas Eve Seven Fishes story and menu with you. I was left to carry on my mother's family tradition. You see, the family believes that I am the one who cherishes most the family and it's traditions. For example, when my Uncle Chico passed in 1995, he left an old RCA floor model radio, built in the 1920s, to my brother. Bob, who was a Marine Corp. career man stationed in Korea at the time and since retired, told my mother when he was informed of the inheritance, "No ma don't keep it for me, I'm not going to appreciate it as much Kathy, pass it on to her." I can still hear my mother reciting what my brother said. Yep, that old radio proudly sits in my living room today. Thought a glimpse of how our family rolls was in order, on to my Christmas Eve story. When I was a child every year we went to my Grandmas house for Christmas Eve dinner before mass. There was fried smelts, Baccala salad, spaghetti with anchovies (Spaghetti con Acciughe), Calamari marinara, and baked fish with lemon, all of which were her "standard dishes". She served a few others of which I have no idea what they were called. There would be eel one time, spaghetti with clams another, and octopus too along with a stuffed calamari. Everything was home made, including the pasta and the bread. Desserts included rum balls, pizzelles, sesame cookies, and a wide array of fruit filled cookies. I remember some sort of almond candy too. Oh and I almost forgot, the spinach pie... Spinach, anchovy, and raisin filled goodness! 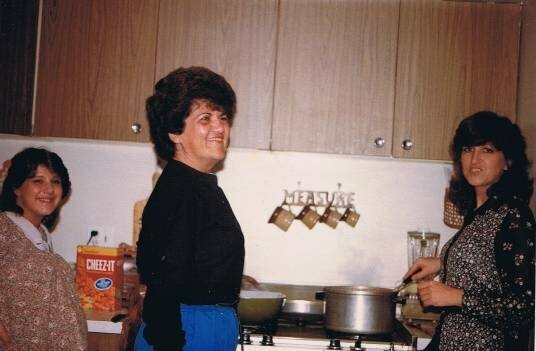 My great Aunts described my grandmother's cooking as exquisite, and the best of all the family! When she got up in years, my mother began preparing the Christmas Eve meals. Since moving to Florida in the early 1980s, every Christmas my parents would come and stay at our house. Together my mother and I prepared Christmas Eve dinner. Even when l they too moved to Florida this continued. By the early 90s, my grandmother had passed and most of family had moved out of Pa. Some moved to the town I live in and the guest list started to look a lot home. Of course living here in Florida alone for some time, I forged friendships that I consider to be family. They too attended our Christmas Eve celebration. I can remember having up to fifty people in the house at times. My mother passed in October 1999 and I can tell you that was the hardest Christmas Eve dinner I ever had to prepare. The entire Florida family, while worn out by the ordeal and and sad at the loss, celebrated Christmas with great joy and thanks. Cousin Lenora(left) Mom and Aunt Joan(right) 27 years ago. Of course they're in the kitchen! And so our Christmas Eve tradition continues. It is my gift to the family until of course it's my turn to pass it on. Trays with a mix of Italian cheeses, sweet red peppers, oil cured black olives, and pepperoncini. Pesto Anchovy Bruschetta, Fried Calamari, and homemade Spinach Pie prepared by cousin Anna Marie. Baked Ziti with meat sauce is always served for those American spouses and friends! Dessert is being prepared by cousin Anna Marie, the family "cookie baker". She will be bringing a huge assortment of Christmas favorites as always! Aunt Joan might just surprise us again this year with pizzelles. The girls in Florida just a few years ago. 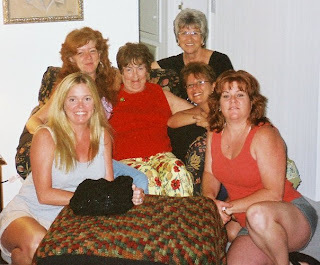 Aunt Joan is in the black shirt, and that redhead on the right is my baby sister. Boy I hope Aunt Joan brings those pizzelles! Wishing you and yours a wonderful holiday season and a very Merry Christmas! I loved everything about this post!! I related to a lot of this post...the Christmas Eve fish dinner, the passing on of traditions and, of course, Florida. Your menu sounds delicious and I know everyone around your table will have a wonderful meal. I thoroughly enjoyed reading about your family traditions. Thanks for sharing it, and Merry Christmas! What a beautiful and tasty menu for Christmas. Merry Christmas and a Wonderful New Year 2010 for You!! This post brought back alot of memories. I wish you and your family a wonderful, blessed holiday season and a very happy new year! I am honored to be part of your post on this lovely feast. Thank you so much for inviting me as part of this heartwarming awesome family gathering.. may god bless you all and have a wonderful Buon Natale feast...and make many more wonderful new memories in 2010...thanks again....appreciate your mentioning me your spread sounds fabulous! Boy, I just love Italian food!! What wonderful memories and family traditions! Really loved reading of your family and esp you carrying on the tradition....there is nothing more special than memories such as these....glad to know you and Happy New Year. What wonderful family traditions. So many happy memories, and the menu sounds terrific! Since, we don't celebrate Christmas, I am in awe at the menus, I have been reading, definitely including yours. Yours is distinctive and classy. Seven fish - wow. Your family looks like a happy bunch. Hope you all had a Happy Holiday. Your family tradition is beautiful! Belated Merry Christmas and a Happy New Year for you and your loved ones! What a great tradition! I loved your story. I am the one with most of the heirlooms too, my aunt and me split it up, but most ended up in my truck, cause she was toting it there! And now I feel weird about getting rid of it, she knew I would! Hope you had a wonderful Christmas! That is so great that you are carrying on these traditions. Your memories are much like mine - my Grandparents made all kinds of fish and seafood - the smelts, clams and scungilli and things I don't remember because I wouldn't eat. But since they passed away we don't go all out now - we keep it much more simple. Your feast sounds amazing! This is quite and amazing feast! Thanks for sharing your memories of Christmas Eve dinner! I can't believe how much we have in common - including PA AND FL! Have a great New Year, Kathy!